Buy your tree directly from a Christmas tree farm. Not only do you get to experience the thrill of picking out and cutting your own tree, but once you take it home, another tree is planted in its place. During its lifetime, your tree will have sequestered carbon dioxide, and the next one planted will do the same. If you don’t have the means to get out to a farm, look for a tree seller with local organic farm relationships. When you visit a tree seller, ask where the trees are from. Most fresh-cut holiday trees are grown on dedicated tree farms in the U.S. and Canada and may be trucked over long distances to the tree lot near you. In addition, many large tree farms use harmful pesticides, so ask how the trees are grown. Ask around at your farmers’ market and search online for organic tree farmers in your area. If you’ve got outdoor space, buy a live tree in a pot to plant in your garden after the holidays. Many conifers are available in pots at nurseries. Be sure to buy a tree that is appropriate to your USDA climate zone, match the tree to your site conditions, and plant it within a reasonable amount of time after the holidays so that it doesn’t die. Or, start a new family tradition and decorate a potted fig or pear tree. More: Is A Potted Christmas Tree A Good Idea? Don’t strangle living trees. If you decorate trees in your yard with lights, be sure to remove them once the holidays are over. Light strands wrapped around limbs can maim—and even kill—a tree if left on season after season. Mulch your tree after the holidays. Don’t just toss your tree out with the trash! 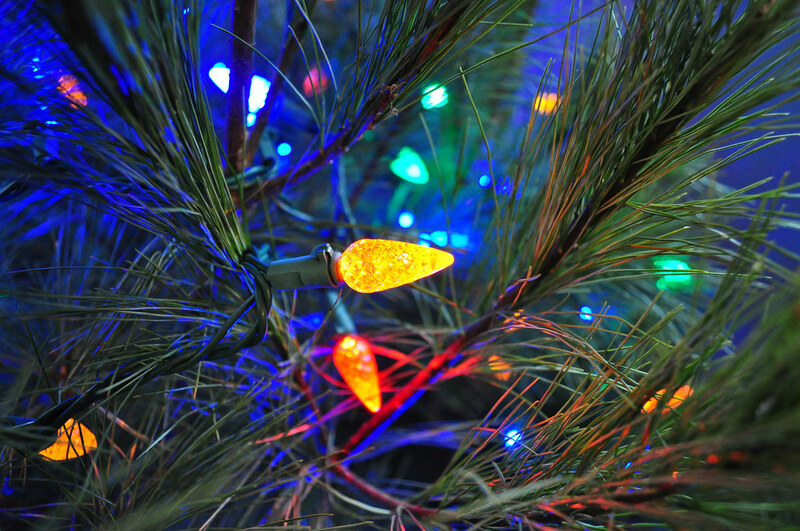 Many cities and towns offer holiday tree recycling and mulching programs. Check with your local government’s sanitation and parks departments to find out what programs they offer. Some cities do special trash pickups for holiday trees to divert them from landfills. And some local organizations arrange holiday tree mulching programs: BBG and Green-Wood Cemetery run an annual tree recycling program each year in Brooklyn, for example. Use LED lights to decorate. LED lights are 90 percent more energy efficient than incandescent lights and last about ten times as long. LED lights also don’t produce much heat and therefore do not pose the same fire risk as conventional bulbs. The U.S. Department of Energy estimates that if all Americans replaced their incandescent strings of lights with LED strands, over two billion kilowatt hours of energy could be saved in December alone. Deck the halls with real holly. Like artificial trees, many artificial holiday decorations are made from PVC and can’t be recycled. Instead of store bought decorations, bring nature into your home for the season with evergreen boughs, holly, and found materials. Or get crafty and make popcorn strings or a gingerbread house. Once the holidays are over, recycle what you can and compost the rest. Use local, organic, seasonal foods in your holiday feast. Visit your local farmers’ market to shop for sustainable meats and produce and look for locally grown items in the supermarket. Try to rely more heavily on seasonal foods that haven’t been shipped from across the world to your table. Use reusable, recyclable, and found materials for gift wrapping. Wrapping paper, ribbons, bows, and boxes create a large amount of waste each holiday season and most foil-lined wrapping paper and decorations cannot be recycled. By wrapping gifts in repurposed items like newspaper, sheet music, or handmade drawings you can keep those non-recyclable materials out of landfills. Better yet, give your gifts in reusable containers like tins, jars, or baskets that can be used year after year. Give a gift that keeps on giving. Rather than buying a loved one the latest fad or yet another sweater, consider purchasing them membership to a cultural institution they enjoy or a yearlong subscription to a magazine or media outlet. Giving someone access to experiences that they can benefit from throughout the year will be appreciated more than a novelty item. Christmas Tree Farm Network (christmas-tree.com/real/). A website that offers a way to locate local live tree suppliers. MulchFest (nycgovparks.org/services/mulchfest/mulchfest.html). The NYC Compost Project in Brooklyn, based at BBG, is one of the sponsors of this tree recycling and mulch program. The Tree Care Primer (Brooklyn Botanic Garden, 2007; bbg.org/handbooks): This comprehensive guide offers tips on purchasing and caring for live trees. Earth 911 (earth911.com). Lists local recycling centers. Rebecca Bullene is a former editor at Brooklyn Botanic Garden. She is the proprietor of Greenery NYC, a creative floral and garden design company that specializes in botanical works of art including terrariums, urban oasis gardens, and whimsical floral arrangements.